A big shout out should be given to the Environmental Protection Agency for their Energy Star program that has been around for several years. The goal of Energy Star is to encourage manufacturers to make products which run on less energy. Less energy means lower bills for your and natural resource savings for everyone. Buying a refrigerator or stove or any other electrical appliance with the Energy Star rating means you’re doing your part. But what happens when you unplug that device and get ready to toss it out? Should the concern about the environment stop? Absolutely not. Which is why GE has teamed up with the EPA’s second major program WasteWise. Once again this means manufacturers need to take the lead. In this case, GE is redesigning its line of refrigerators to reduce the amount of landfill waste generated by a single ice box. By adapting a new type of insulation and form of plastic, GE hopes to reduced the weight of a fridge waste by around 85% from an average of 55 pounds to just under 8 pounds. They have also put out the call that they’ll be on the receiving end of all those product materials like circuit boards, glass, foam and plastic that go into the composition of every refrigerator. Hopefully, the other major players will follow GE’s lead and get on board this program. All of this points out the importance of proper refrigerator disposal. If you’re planning on swapping out your old model for a new and improved version then you want to make sure you take care of junking that ice box the right way. The “wrong way” is leaving it around your home or property. If you don’t lock up that fridge or remove the door you could be facing some very serve fines. The law on the books makes it a crime not to secure any refrigerator you’re not using. To avoid that hassle, what you should do is hire a team of professional junk haulers who can not only get rid of your fridge but do it the right way. Most people don’t think about where there junk ends up and that’s a major problem. When you hire those junk haulers, ask them where your trash will be headed. You might be happy to hear they’ll be dropping it off at the closest Charlotte recycle center. Your refrigerator might not end up at the same place as your plastic bottles but that’s not something you have to worry about when you hire the right team of junk haulers – Junk King Charlotte. As long as you are going to have a full crew show up to take away your fridge you can also get them to remove any other bulk piece of junk you want gone. 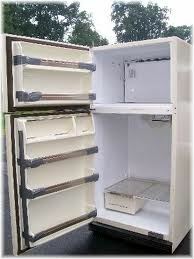 If they can carry out a refrigerator they can certainly carry out an old sofa, television, stove or even row boat! Be smart about how you get rid of junk, go with Junk King Charlotte. This entry was posted in Charlotte Appliance Disposal, Charlotte Furniture Disposal, Charlotte Junk Hauling, Charlotte Junk Removal, Junk King Charlotte, Old Refrigerator Disposal and tagged Charlotte Appliance Hauling, Charlotte Hauling Service, Charlotte Junk Removal, Charlotte Refrigerator Disposal on May 30, 2012 by Terendius David. Last updated August 2, 2017 .